Thanks, ladies on those comments you left on my last post about my friend and I. It was so sweet of you to reassure me that my skills in makeup is not waning. I promise to improve on it because you'll never when the day comes I get to play makeup with you, beauties! Do you remember those posters and even actresses who sported green goopy face masks, rollers on their hair and red red lips? Well, for me that reminds me a lot of Filipino comedy movies. It reminds me of Bella Flores and Tiya Pusit. These ladies are usually the contrabida in the comedy films. Well, my point it, the LUSH Mask of Magnaminty reminds me all of that whenever I have it on! :) I bought a small tub of it at The Lush Bonifacio High Street and I don't regret it one bit! Anyone who knows me well knows my love for anything mentholated, spearmint, peppermint, as long as it has minty will have my attention. This one has all my attention. 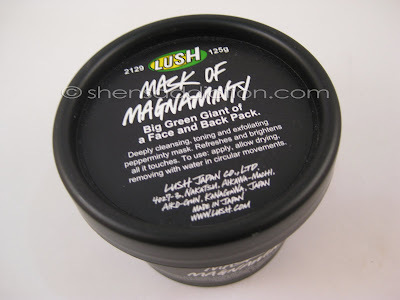 Lush.com.ph has this to say about Mask of Magnaminty. "The big 325g tub of Mask of Magnaminty will do you a number of thick facemasks, if you only use it on your face. We designed it to be used on your back too; coming up to summer you'll want to make sure than those zits are zapped and you can strip off and expose the parts that have been hidden away. Get someone to plaster this lovely, thick, green-scary-monster colored, very minty mask all over your back if you want the full treatment. The Bentonite gel and kaolin mixture absorbs oils and deep, deep cleanses your skin, honey and marigold oil are very calming on the greasy parts and astringent peppermint oil stimulates and decongests your skin. The ancient Greeks and Romans scented their bath water with peppermint and used it to stimulate clear thoughts, concentration and inspiration. Leave the mask on for 10-15 minutes and who knows what good ideas you'll come up with while your face and back are getting a good old clean up." I definitely agree with Lush.com on those regard. 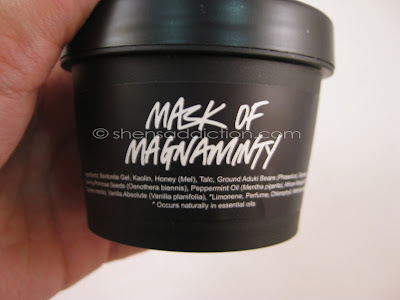 Mask of Magnaminty is very refreshing, leaving my skin smooth and soft. I'm usually drawn to this mask when I feel a breakout coming on or when I have a nearly dried out pimples. It soothes my skin and lessens the redness. The scent is just invigorating. It's what I call a comforting mask. 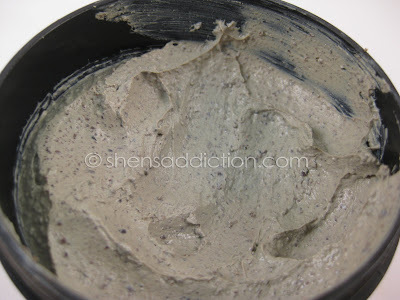 The Kaolin clay absorbs the oiliness of my skin that makes it a good cleanser. The Peppermint just wakes up the dullness off of my face and leave it looking well taken care of. I usually put on this mask in the morning before I take a bath. When i wake up in the morning, I cleanse my face with my usual facial wash and towel dry. After which, I slather this goop all over may face with my hand. I wait for it to dry. I don't have a time limit, I'll know when I have a hard time smiling or talking and feeling it up. :) Then I walk in to the shower and as I bath, I remove it using circular motion. Not too harsh, ladies, or you'll hurt your skin and make it red. I don't re-wash my face anymore as the mask will serve as my morning cleanser during shower. Here's me after a night of bonding with girlfriends. :) I thought to use the facemask before I went to bed to give my skin a breather from all the products I've been putting on. 1. Use a nose strip a day prior to using this mask and you'll see that your pores looks a lot cleaner. 3. Never let it sit for too long as it will dry your skin too much (believe me on this one!). Maximum of 20 minutes is my limit. 4.spray your face gently with the shower head to softent the mask before you scrub it in circular motion. I'm nearing the bottom of it and I plan on purchasing another tub again. :) It's fast becoming my HG face mask. Ingredients are Bentonite Gel, Kaolin, Honey (Mel), Talc, Ground Aduki Beans (Phaseolus), Glycerine, Evening Primrose Seeds (Oenothera biennis), Peppermint Oil (Mentha piperita), African Marigold Oil (Tagetes erecta), Vanilla Absolute (Vanilla planifolia), *Limonene, Perfume, Chlorophyll, Methylparaben. Price is P325.00, Available at all Lush boutiques. check out http://lush.com.ph for more Lush products.